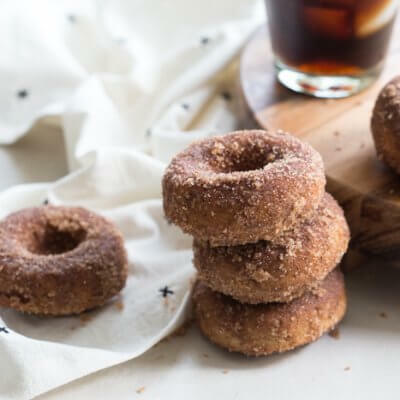 Gluten Free Cinnamon Sugar Cake Donuts… the best homemade gluten free donut you’ll ever eat. Preheat the oven to 425 degrees F; grease a 6-count non stick donut pan with pat of butter and paper towel, or spray with cooking spray. Grab a large microwave safe mixing bowl and melt 4 tablespoons butter in microwave. Stir in the maple syrup and vanilla extract, and beat the egg into the mixture. Add baking powder, salt and almond milk to bowl and stir until combined. Stir in the flour and mix until fully incorporated. Spoon the batter into the donut pan and spread it around to create a smooth surface. Bake donuts for 10 minutes; remove the pan from the oven and allow donuts to cool. Pour sugar and cinnamon into a plastic bag and toss in the donuts. Seal the bag and gently give it a shake to coat each donut in cinnamon sugar. Store in airtight container.